For Quote please contact our friendly sale team. 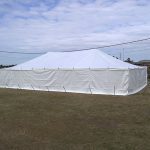 Peg and pole tents for sale Durban, Johannesburg, Pretoria and all over South Africa and Africa. These tents are mainly used for events, functions, parties and weddings but can also be used as warehouse tents, refugee tents, camping tents, shelter tents, emergency tents, army tents, relief tents, disaster tents, storage tents, exhibition tents, military tents and many more. All our tents have a 10-year workmanship guarantee on them so they will never break down no matter the weather condition. Our tents are designed and manufactured to withstand almost anything that mother nature throws at it. The waiting period for a tent is 2 weeks and we do offer a 3 month layby if the client is unable to pay cash. Our company was established in 2010 and has henceforth become the top leading manufacturer, supplier, wholesaler and distributor in the world. We are known worldwide for our superior quality and reasonable prices, not many companies can compete with our prices because unlike other companies we care about customer satisfaction before making a profit. All the machinery that we operate is always updated to keep on track with current customer demands. We have a staff count of over 500 people and all these people hold a special skill that makes this company unique in every way. We have only skilled craftsmen on the floor manufacturing and designing tents to the best of their ability and at the other end of the factory, we have our director and sale personal devising the possible prices that are both affordable and reasonable to the client's pockets. We manufacture tents South African Provinces such as Kwa-Zulu-Natal, Gauteng, Mpumalanga, North West, Northern Cape, Western Cape, Eastern Cape, Free State, Limpopo. We also supply African Countries such as Namibia, Botswana, Zimbabwe, Nigeria, Kenya, Niger, Morocco, Ethiopia and so on through Africa. Our company also distributes to places like Chatsworth, Phoenix, Ballito, Bloemfontein, Durban, Cape Town, Pinetown, Westville, Kloof, KwaMashu, Umlazi, Isipingo and many many more. Peg and Pole Tents for Sale South Africa. 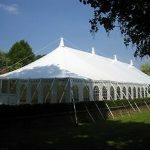 We Manufacturer & Supply Pole Tents for Function, Event, Private party & wedding. Buy Discount Tents. We supply top quality Tents to our clients from countries like South Africa, Zambia, Zimbabwe, Angola, Swaziland, Namibia, Nigeria, Lesotho, Mozambique, Kenya and Botswana. Because we have an enormous experience in the fabric and other related sectors. We have acquired core capability in manufacturing and dealing with high quality Tents. Our mission of the business is connoted with suitable delivery, reasonable price and extensive range of products. Today we have an endless experience in the factories where our products are manufactured include world-class machines and other products. Customer satisfaction is our motto, which drives our complete activities. Through our strong and uniform dealer and distribution network, we have registered a strong grip in the global field especially in the field of Tent Manufacturers. Our peg and pole tents come in many different sizes and colours compared to other companies. We are the only company to offer superior quality at the most affordable prices. All our tents are manufactured using high quality materials. We have branches all over South Africa for your convenience. When a client approaches our doors we aim to give that individual an experience they will never forget but giving the customer good service and being attentive to their needs each and every time. When you buy a marquee tent u also get the poles, pegs and ropes free. Our company offers a huge array of sizes for the client to choose from. We now give the client an option of customizing the tent with a unique branding of the clients choice. Our peg and pole tents can be made in any colour the client's desires. 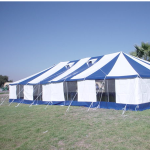 We are Peg and Pole Tent Manufacturer, Suppliers, Wholesalers, Stockist & Distributors in Durban Africa. We have tents for sale that can be used for events, functions, parties, exhibitions and weddings. 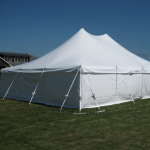 We make marquee tents at cheap and affordable prices. Our main goal in this business to give customers peace of mind that they are getting quality products at the best price possible.